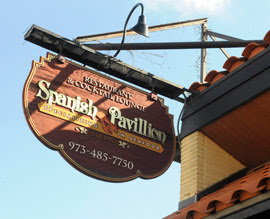 In this Kitchen Nightmares episode, Chef Gordon Ramsay visits Spanish Pavillion in Harrison, New Jersey, opened in 1976 by Antonio Fernandez, he left the restaurant to daughter Balbina and his grandsons Michael and Jerry. Michael is barely in the kitchen, Jerry is barely in the restaurant and Balbina is stuck in the middle of the feuding sons. The restaurant has few diners and is in $550,000 debt. Gordon orders lobster bisque, paella and a chicken and garlic main. The lobster looked like it was already dead before it was cooked and Jerry tells him that the lobster came from the tank and when he looks in the tank there is a dead and decaying lobster. The chicken and garlic dish arrives swimming in oil and the chicken is dry and the paella is over seasoned and over cooked. Gordon arrives to observe a dinner service and Michael is behind the bar. The brothers argue and Michael gets angry and assaults cook Al so he is removed from the kitchen and reprimanded for his behaviour. Gordon arrives the next morning, the walk-in is packed with meats, the fridge has dead lobsters inside and a pigeon is flying around the kitchen. Gordon shows them what he has found and tells Michael that he is wasting money buying so much food, he admits he is overwhelmed. Gordon teaches Michael a garlic chicken dish and Michael makes a octopus special that Gordon loves, both dishes become the specials for that evenings service. For the evening dinner service, Michael is working behind the line and Jerry is expediting at the pass. Michael shows his lack of confidence at first but the customers love the new dishes, however a chicken dish is sent back to the kitchen as they have used spoiled chicken! Jerry steps up and the food begins to leave the kitchen and customers are happy. Overnight, the restaurant is given a makeover with new furniture and china. Gordon shows them there are 40 Spanish restaurants and they need something that will make them stand out. Gordon introduces a range of home made tapas dishes and tells them no more tuxes for the waiters! For relaunch night, the kitchen gets off to a great start as customers love the food. But as more diners arrive the kitchen begins to fall apart with Michael getting confused and not listening to Jerry. Michael starts to get angry and Gordon pulls him aside to tell him to get it together and respect his brother, he turns it around and the relaunch ends a success. With a final pep talk from Gordon he tells them they can turn this around and praises them for the good job they did at the relaunch. Gordon revisits and sneaks around the back to have a look in the fridge and finds it organised and clean. Jerry reports business is good and that Michael is no longer involved in the restaurant. Gordon checks the lobster tank. Gordon orders a paella and Jerry sits down to eat with him, he says it is delicious. Sadly his Grandfather passed away between filming and the revisit. They are open with mostly good Yelp reviews. Planning a visit? Check our their website for opening hours and further information. Spanish Pavillion aired on January 21 2011, the episode was filmed in November 2010 and is Kitchen Nightmares season 4 episode 1. I'm glad to hear that they are still open. Equally glad that the walk in is clean! Very sorry to hear their grandfather passed. My condolences. Well, I have to be honest. I was willing to bet that this one was going to close, simply based on the amount of area restaurants serving Spanish food. Being from Minnesota,which is essentially in the middle of the North American continent, there aren't many Spanish restaurants and I have never tried it before. Plenty of Mexican, but no Spanish and I think that it's safe to say that is like comparing Chinese and Japanese food. Good job! Spanish Pavillion still open today. Keep it up. Don't let the haters bring you down! Happy new year 2019!